It is important to conduct training for all pharmaceutical employees and according to FDA a proper record must be maintained for all training programs conducted. The FDA compels every drug or medical devices manufacturer to train every employee starting with the regulated procedures to the CFR requirements. The FDA training requirements in pharmaceuticals are defined in 21 CFR 211.25 and have three key aspects. Each employee that has a role in the production or storage of a drug needs to have sufficient education, training, experience or any possible combinations. Each employee has to be trained in the exact process or operation he is involved in and must be given detailed information. The training of each employee must include the CFR regulation and the written procedures specific to his role in the company. The training can only be delivered by qualified personnel and has to be frequent enough in order to make sure the employee is familiar enough with all the requirements specific to the role. The second group of interest is represented by the supervisors of the employees above. Every supervisor involved in any of the stages of the development, manufacturing, and storage of the drugs needs to be properly trained to be able to ensure the safety and the quality of the drugs. The third issue covered by the Code of Federal Regulations that relate to training refers to the number of qualified personnel that is properly equipped and qualified to either perform or supervises the entire process. In other words, the pharmaceutical company needs to make sure that they have enough qualified personnel to manufacture the drugs and supervise the process. This is an important issue because fewer employees mean a high workload which in fact leads the employees to a sloppy work and mistakes the pharmaceutical industry can’t afford. This includes specific training schedules and information for each function and employee. The training information must include CSR regulations and specific training plan that includes all the procedures specific to that job function. The next step is to actually train the employees with qualified instructors. The training has to be specific and provide all the necessary information to the employee and, if possible, study cases and scenarios. The training must include corporate training requirements (safety, orientation, and quality systems), training requirements specific to the job, re-training information. Re-training will be conducted on a regular basis but also when there is a change in SOPs (standard operating procedures) or the first training proved to be ineffective. The effectiveness of the training provided must be constantly evaluated. A method for evaluation of training can be a test given to the employee on the last day of training and constant supervision. Detailed records and documents that illustrate the training already provided, the content, the results and the date the next training session should be delivered to each employee. All the documents related to personnel training will be reviewed during an FDA inspection. In the pharmaceutical industry, the proper training of the personnel is crucial. To meet the FDA requirements the company needs to develop a complete, detailed training program that will lead to a successful training of all its employees. Need have GMP facility, certification like Ayush, HACCP,ISO and FSMS requirements. Process will be same as Pharma but here we follow the guideline/formulation as per Ayurveda. 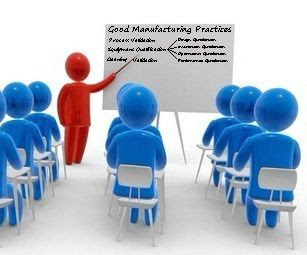 In my opinion, cGMP training must be applied not only to Manufacturing, Warehouse and Packaging people, all the personnel involved, even the guest who is coming to the site. Other tip, guest must be accompanied during site tour with authorized persons, who have knowledge of cGMP.